Old postcards are some of the "other stuff" I collect. 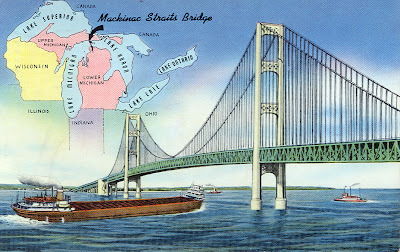 This one features the Mackinac Bridge, the beautiful, five mile long engineering marvel that connects Michigan's Upper and Lower Peninsulas, spanning the deep, cold, and dangerous waters of the Mackinac Straits. It marks the division between two of the five Great Lakes, Michigan and Huron. The bridge opened to traffic on November 1, 1957 after decades of planning, three years of construction, and the tragic deaths of five crewmen, including a diver, welders, and iron workers. Although the bridge opened in November (a notoriously unpredictable weather month in northern Michigan), the official dedication ceremony didn't take place until June 25 of the following summer. 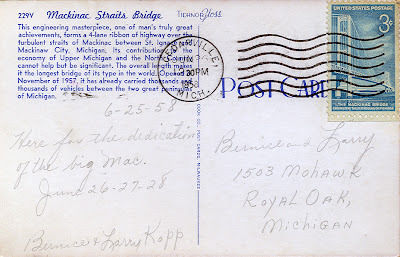 Bernice and Larry Kopp of Royal Oak, Michigan, a suburb of Detroit, attended and cleverly mailed themselves this souvenir postcard. 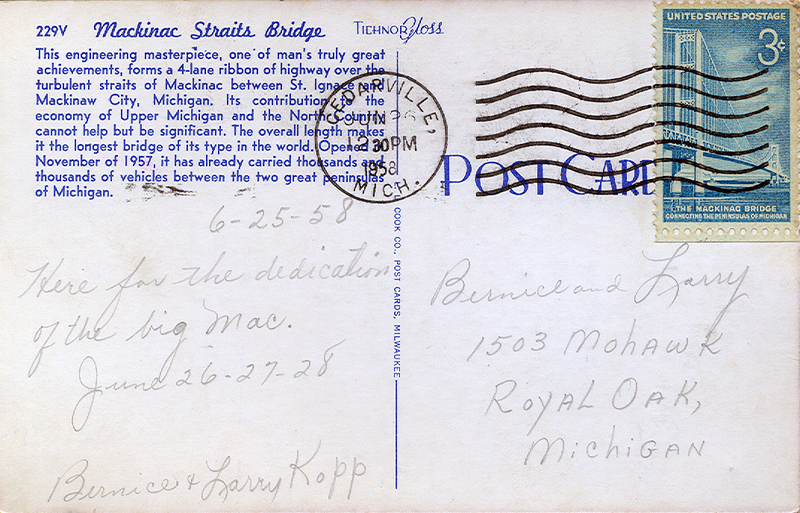 "Here for the dedication of the big Mac, June 26-27-28," Bernice wrote, before addressing the card to their own home on 1503 Mohawk. Beneath all this wear is a 1930s Minnie Mouse lead figurine, just 2 1/2 inches tall. She's clearly been through a lot, but is still smiling. 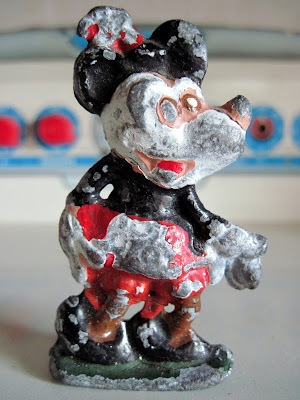 7 inches tall, circa the 1950s. Found this far out game at a summer antique show: Mentor, the Electronic Wizard, made by Hasbro in 1960. The giant bronze plastic head is Mentor. He looks like something out of Metropolis, an Art Deco robot with a mind of his own. To play, you select one of the cardboard game tracks, and insert it into the board. You and Mentor then take turns moving the pawn (a giant finger) along the track. Mentor tells you how many spaces he wants to move by flashing the lightbulbs on the base. First one to the finish wins, and it's usually Mentor. Mentor, in a characteristically thoughtful mood. The moving finger, wired up to Mentor. Mr. Potato Head and I have a longstanding love affair, but occasionally I succumb to the charms of one his imitators. 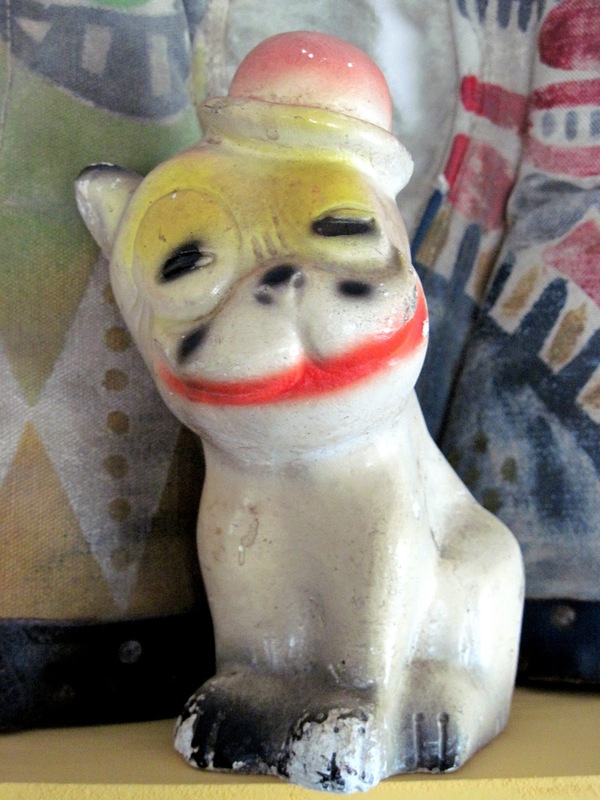 This "Funny Face Kit" was made in Hong Kong in the early 1960s, a low grade knock-off of the original. The whole set is just 5 1/4 inches tall, made of cheap plastic attached to a thin card. Potato Head experts have discovered these originally came in cellophane bags, and were distributed via dime stores or as carnival prizes. Visit mrpotatohead.net, source of my arcane knowledge, to see more fun fakes. As a kid, I adored the gumball machines full of tiny toys in the entrance of the grocery store. I would save my change for weeks and then, like a casino slots addict, feed coin after coin after coin into my favored machine, never giving up my belief that if I put in just one more dime, I'd finally get whatever must-have item had obsessed me. Once I grew up, I was delighted to discover that private citizens can buy their own gumball machines, and I now have 5 vintage venders full of fantastic treasures in my dining room. Still, I'm always on the lookout for cool gumball prizes when I'm antiquing (and actually, still at the grocery store too.) I found this lot at a show this summer, and it had some really great pieces, mostly from the 1960s-70s. but it's also full of tiny treasures. My favorite piece was this little pink guy with a really big nose. Monster charms are always a good find; these are from the '60s. Oh joy of joys: a bunch of Funny Froot rings! I lusted after these as a child, but sadly, only ever got the Avocado Man (second from right). And last but not least: tiny fish and clamshell charms. I can remember seeing these as a kid, too, and being profoundly disappointed when, several dollars worth of dimes later, all I had gotten were lame stickers. Vintage space toys are some of my favorites, and I'm always on the lookout for them at antique shows. Recently I found these 3 fabulous space guys. At 3 1/4 inches tall, they're smaller than the famed Archer Space Men, but they have their own great style. Marching into the future, circa the 1950s. I found the most beautiful set of toy blocks at an antique show this summer, and I've never seen another like them. Made of lithographed paper over wood, they are most likely from the McLaughlin Bros. company, and date circa 1890. Each block is 4 inches tall, and each side is different, making the blocks many toys instead of one. One broad side has Fairy Land Railroad cars while the other has a Punch and Judy show, and the narrow edges have either numbers or soldiers. The alphabet runs along one side too, like a frame. We'll start with a few of the Fairy Land R. R. cars, which depict characters from famous fairy tales, nursery rhymes, and classic children's stories. Turned horizontally, they can be lined up to make a train. The character sneaking a peek into the candy car is Mr. Punch, the famous maniacal puppet. By turning the blocks around and standing them vertically, they make a complete Punch and Judy show. Oh no: Mr. Punch shakes the baby! Then, he and Judy smack each other with sticks. ...but somehow he gets out of it. What a fantastically versatile toy: can't you just picture a little Victorian child playing with this by the hour on the floor of the nursery?